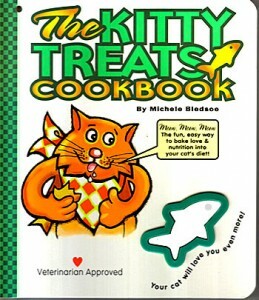 There has never been a more fun and easy way to bake love and nutrition into your cat’s diet. Our professional kitchen tested hundreds of Kitty Treats on very finicky felines and selected the top recipes for this book. Bare Claws, Tail Mix, Kit n’ Trim (a diet treat for the cat that bounces, not pounces), Paw Lick n’ Chick n’, Fish n’ Nips, are just a sample of the Purrfect treats included in this book. A fish-shaped cookie cutter comes with every book. Veterinarian approved recipes. Color illustrations fill every page. Your cat will give you the paws up!